There is loads of distinctive style you’ll enjoy when you drive around in a new 2017 Citroen C3. The new C3 is very different to what most cars in its class look like, and that can be a good thing. 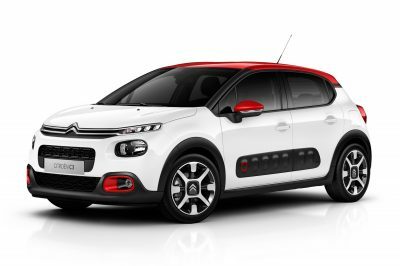 A wide grille is set quite high on the C3’s nose, with LED daytime running lights being placed where you would more conventionally find headlamps displayed. Think Nissan Juke quirkiness, and you’ll start to see how the C3 might stand out from the crowd. The new C3 looks more in keeping with a Cactus than the previous C3, so let’s take a closer look. Two tone exterior paintwork offers a lively, fresh combination to the small hatchback package; and like them or loathe them, the quirky airbumps on the door panels are there to protect the car when car doors swing open carelessly in the shopping mall carpark. A total of nine exterior colours combining with the choice of three roof colours means that your new C3 will most likely look different from your neighbour’s C3. 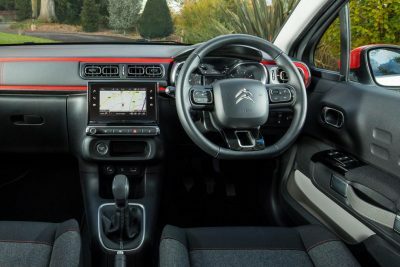 Enter the small Citroen C3 interior, and the styling is, perhaps, more conventional and in keeping with what you might expect. However, there are some nice colour options for the front dash. The red striping in particular looks pretty cool. 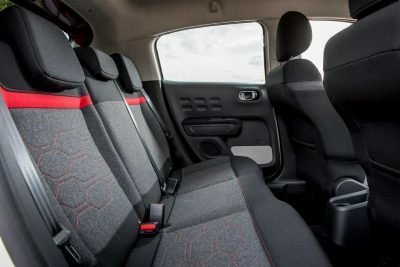 Citroen seating is always very comfortable, and when you opt for the Comfort package the front seats are superbly relaxing – much in the same way as your lounge suite might be at home. The standard Grey Mica cloth interior is unique and pleasant. Lots of storage options are found throughout the C3 cabin and make travelling inside a new Citroen C3 very easy to live with – and particularly handy for a small family. 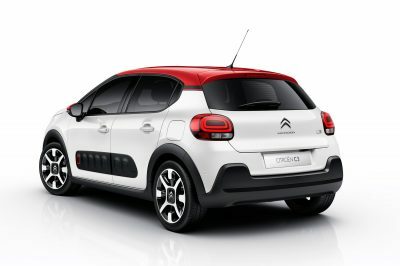 This latest C3 design is actually longer, wider, and lower than the outgoing C3 model, so it has has a cabin with greater width and more rear seat passenger space – which is a great plus for a car in the small hatchback class. 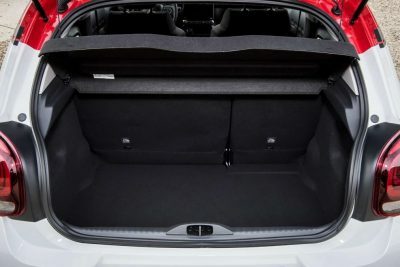 Boot space is around 300 litres. Having read through the last paragraph you might get the picture that the new C3 is all about comfort and less about sport; and you’d be right. The car rides compliantly over road undulations with more body roll than most other hatchbacks in its class, however the handling is far from dull. There is good grip and control, but it comes without the sharp instincts of a hot hatch. Australia gets the petrol-fed 81 kW PureTech 1.2-litre turbo engine with an EAT6 6-speed automatic gearbox. Responsive, economical performance is what you’ll enjoy, and the blend is smooth and functional. The engine might be just a simple 3-cylinder layout, but the torque offering is over 200 Nm – quite impressive! You can expect an average fuel consumption to be around the 5 litres/100 km or even less – another impressive figure. In Europe, there are two HDi engines (turbo-diesel motors) available that are hugely economical. The more powerful of the two is a strong motor with great performance and efficiency. Hopefully we might see this one in Australia, too! In Australia we do get well equipped C3 models. A 7-inch touch screen boasts a mirror screen, Apple CarPlay, Android Auto and MirrorLink. Bluetooth and USB connectivity, a nice audio system and the all-important ‘Coffee Break Alert’ feature come as standard. On the safety front, the 2017 Citroen C3 has earned itself high 4-out-of-5 stars – dropping 1 star due to the nonexistence of ESC. In the actual impact protection, the Citroen C3 is very strong. Handy features like the reversing camera, parking sensors and cruise control do make life easy and relaxed for the driver. The ConnectedCAM system is an optional feature that offers a wide angle camera with GPS, and it has the capability of being able to record footage in the event of an accident. Rolling on a snazzy set of 17-inch diamond cut Cross alloy wheels adds to the styling individuality that the 2017 Citroen C3 possesses. If a comfortable and economical hatchback with seating for five is what you’re looking for, then the quirky new C3 might be worth a squizz. For any more information on the latest Citroen C3 models or, for that matter, any other new car, contact one of our friendly consultants on 1300 303 181. If you’d like some fleet discount pricing (yes even for private buyers! ), we can submit vehicle quote requests out to our national network of Citroen dealers and come back with pricing within 24 hours. Private Fleet – car buying made easy!